My husband Greg and I often travel together for business and fun; and this often yields a good bit of comic material. On a recent trip home, we were hauling around enough luggage to outfit the entire cast of Glee for a week, plus golf clubs. (“Learning to pack light,” is on my To Do List.) As is often the case, when we are in a hurry trying to catch a plane, Greg exits the elevator with his suitcase and golf clubs, unaware that I am scrambling to get my suitcases turned around and facing the right direction — when the door closes and takes me to some strange floor, not of my choosing. I always get tickled when this happens. Greg is patient, but doesn’t see as much humor in it as I do. Last week we were on a plane together, but had to sit in separate seats. Upon descent, a rogue lap top computer went zipping down the aisle. The limber and alert flight attendent expertly caught it right before it hit the cockpit door. Guess who’s lap top it was? The look on Greg’s face as his wife’s computer went whizzing by his seat, then looked over at me, was priceless. 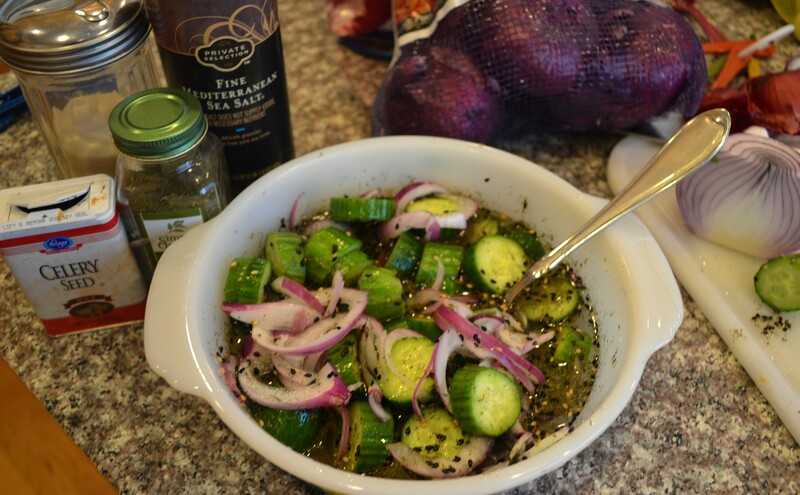 It makes a nice alternative to green salads, especially for picnics or potlocks. 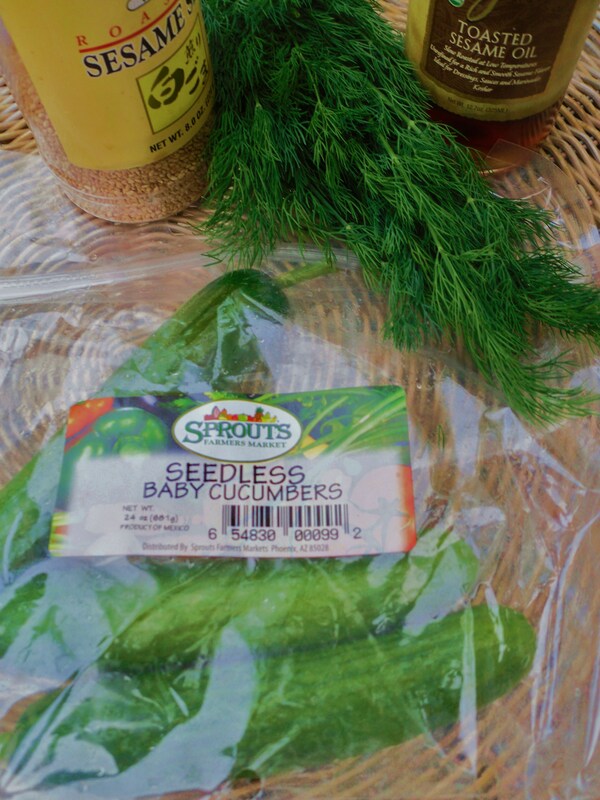 I got the small cucumbers at Sprouts, but have also seen them at Whole Foods and Sam’s Club. There’s only a small amount of sesame oil, but it really packs a punch of flavor. 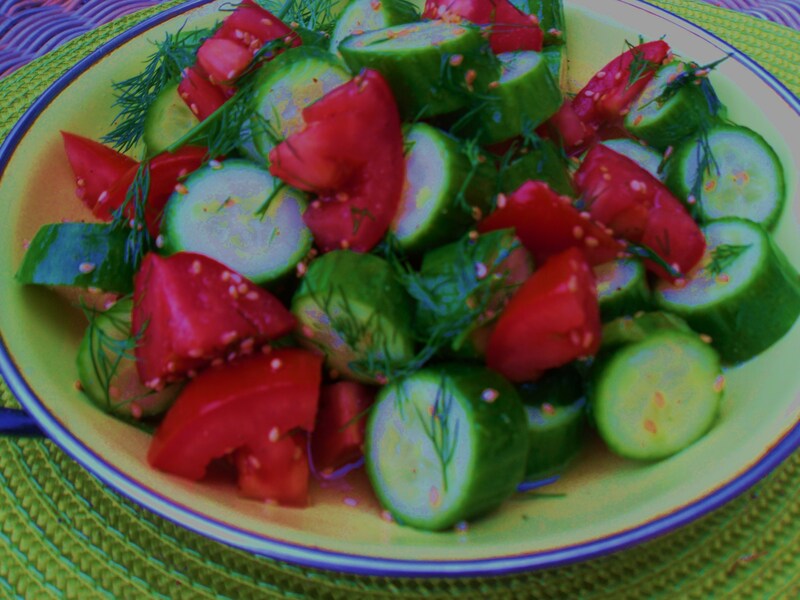 Place chopped cucumbers and tomatoes in a bowl. Mix the rest of the ingredients in another small bowl and whisk. 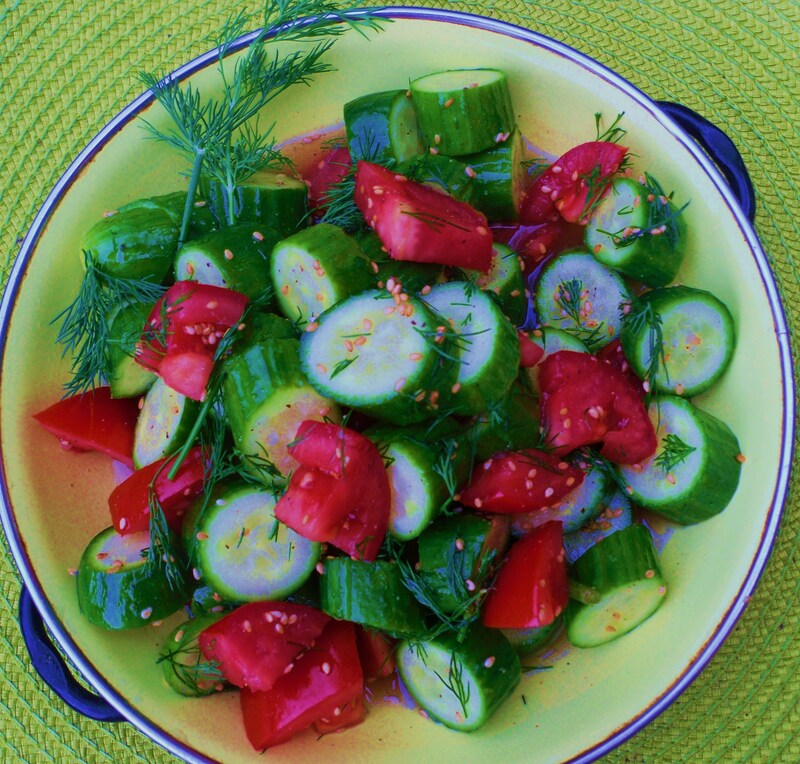 Pour dressing over cukes and tomatoes Let set for about 30 minutes in the fridge before serving. Keeps well in a Tupperware-like container for at least one more day. Not long ago, I enthusiastically wound up my Cuisinart salad spinner, a gift from my efficient salad-loving daughter. What I did not do was read the instructions, which I’m now guessing said something like, “Wait until the inner whirling colander comes to a complete halt before removing the lid.” If you remove the lid early in the spinning process, I can testify that you will immediately give your entire kitchen, including ceiling and floor, a certain lettuce-based Rain Forest look. 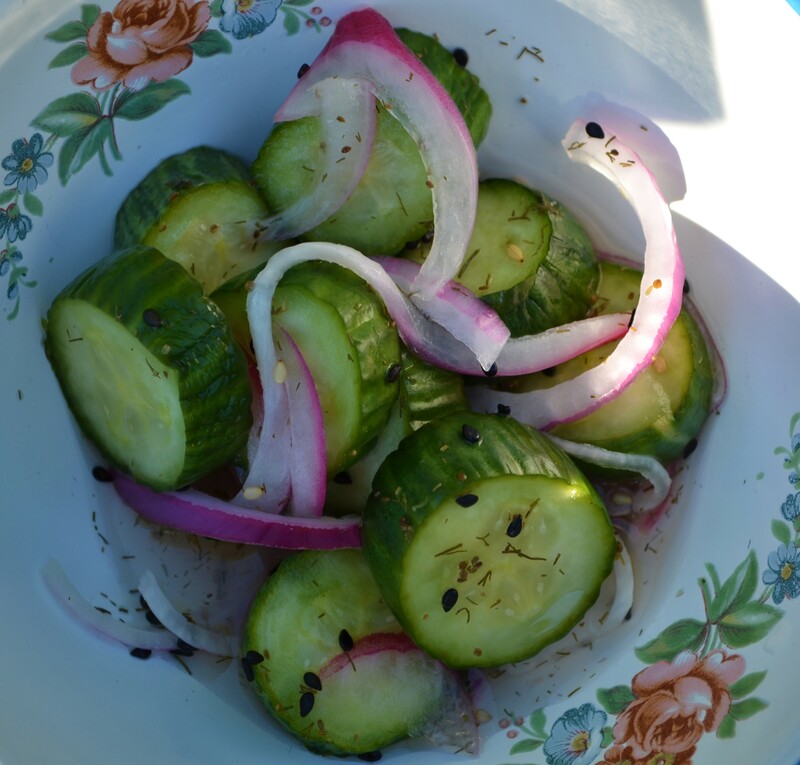 However, if you use it correctly, a salad spinner is quite the nifty item to dry the lettuce mix for this recipe below, one of my favorite salads. The “dressing” is mixed as you toss the salad, no need for a separate bowl. 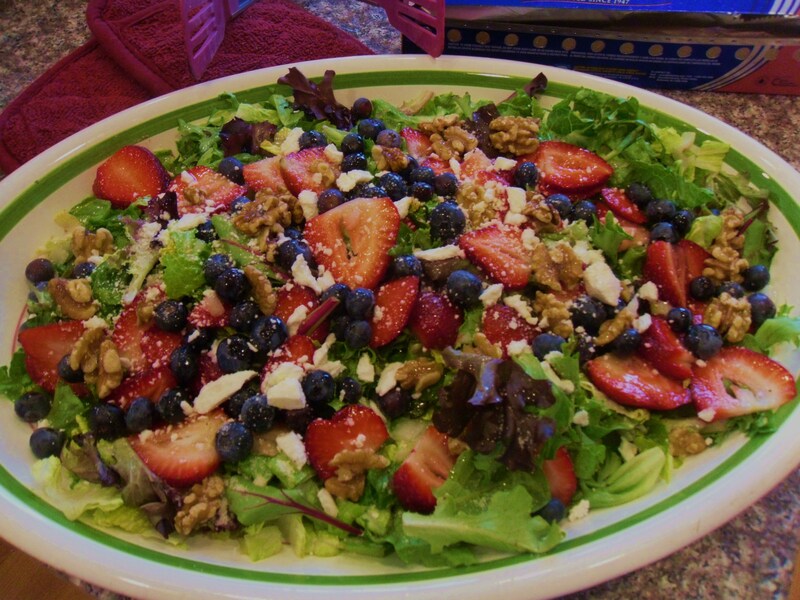 In a large salad bowl place the greens, berries and toasted nuts. Squeeze juice of one small lemon over all. Toss. Sprinkle the leaves with sea salt and sugar to taste. (Hint from professional chefs: salad always tastes better and you use less dressing if you lightly salt the greens just before serving.) Toss. Finally squiggle about 1-2 Tablespoons of olive oil. 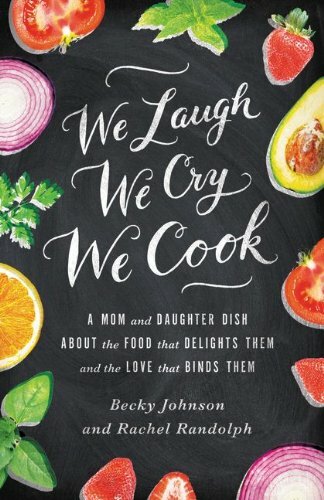 (My good friend Lucille gave me a bottle of Meyer Lemon Olive Oil featured in the picture- so good in this recipe!) Toss gently again. This is a taste-as-you-go salad. The dressing should taste sweet & sour — like lemonade or “lemon drops” — with just enough salt and olive oil to make it savory. 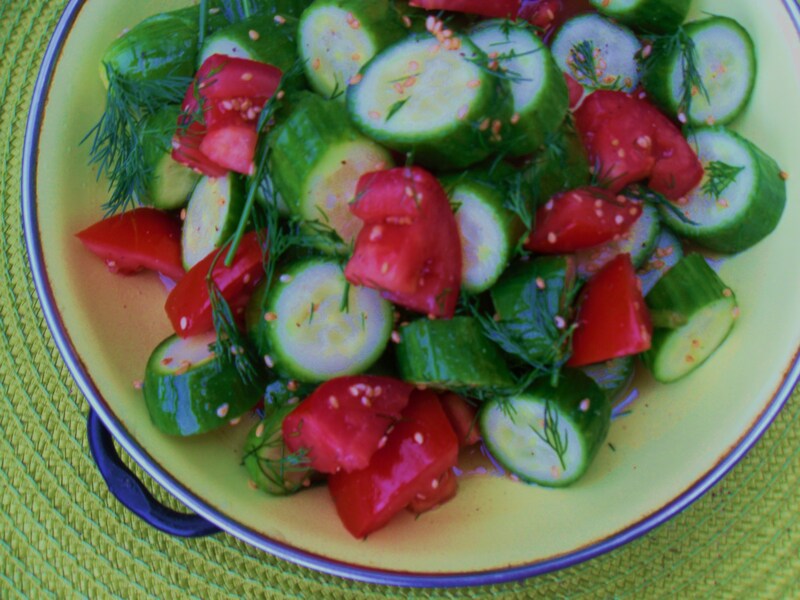 This salad is a light go-to side dish that goes especially well with heavier main dishes. Once you get the method down, it is also one of the fastest, easiest salads you can throw together – and everyone loves it! 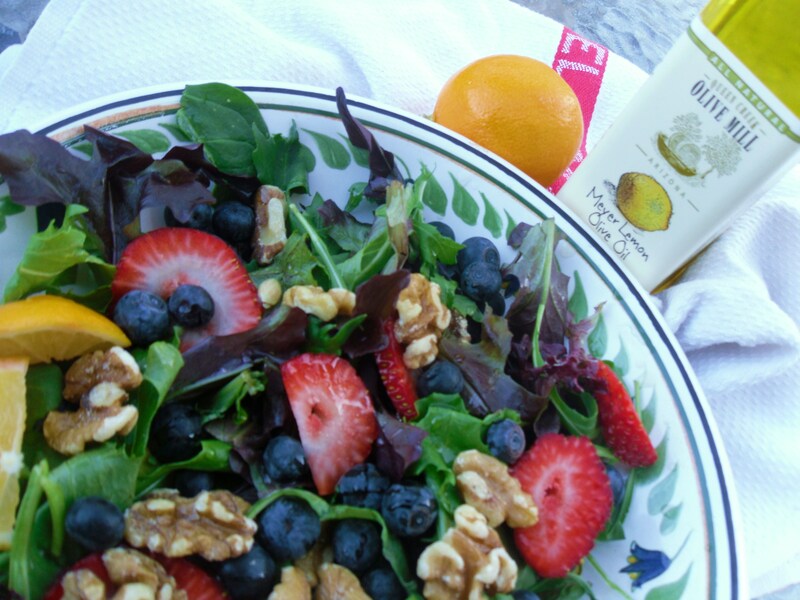 Try using sliced green or red apples or sliced peaches in place place of berries, for a salad that refreshes in all seasons. 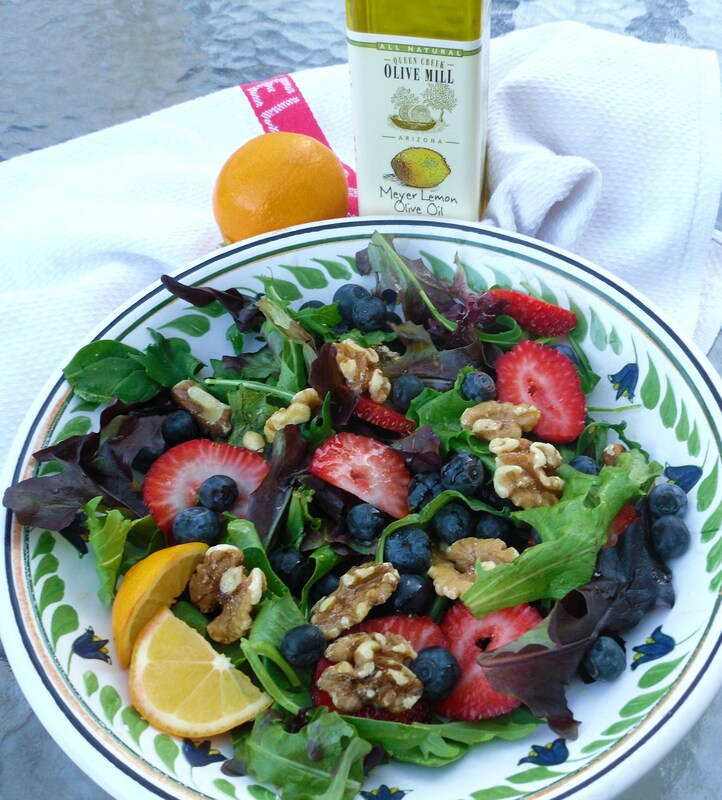 I made a huge version of this salad on a big oval platter fothe holiday. Not a drop of salad left, and it was so beautiful. 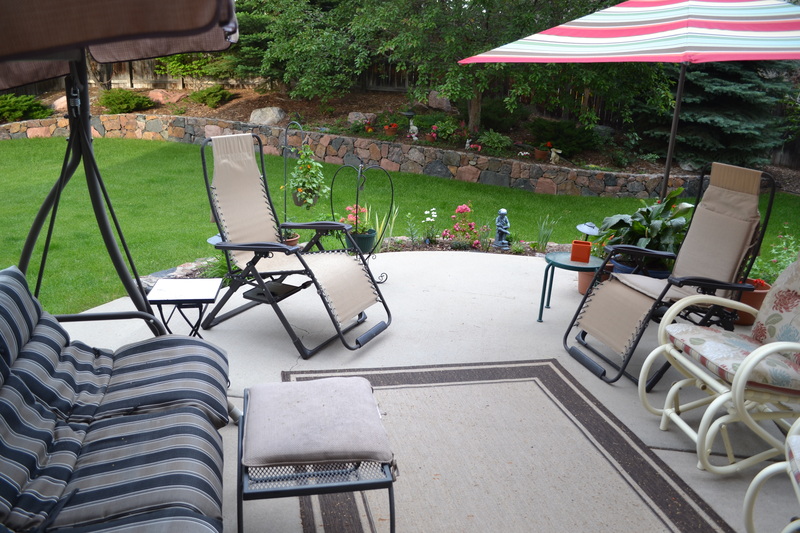 Looked like a Spring garden! Added some goat cheese to this version. Yum!